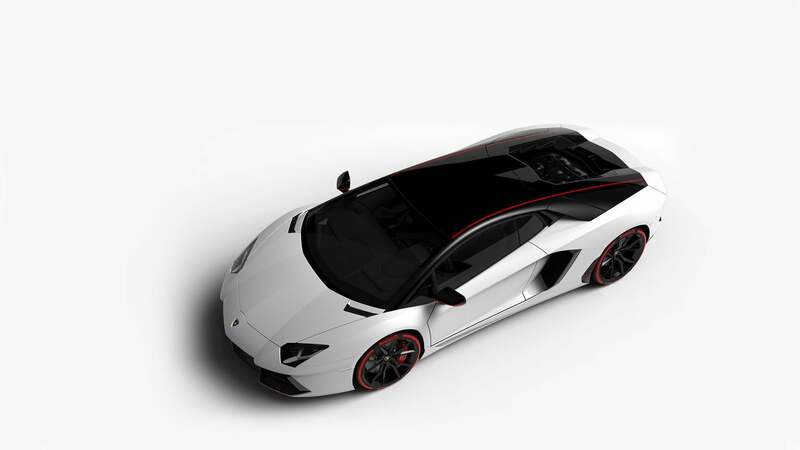 Overhead view of a pearl white Lamborghini Aventador Pirelli with black roof marked by red side stripes, set against an undistinguished background. Cropped close-up of the tail end. The success of the Lamborghini Aventador meets Pirelli's charm. The new Aventador Pirelli, available in the Coupé and Roadster versions, offers all the technical features that have made the Aventador so successfull at the global level, including the carbon fiber monocoque, the 12-cylinder engine, pushrod suspension, and the permanent all-wheel-drive. In addition, the Pirelli special series has added ad hoc exclusive equipment designed by Centro Stile Lamborghini. Side view of the rear half of a Lamborghini Aventador SV Roadster racing along a road with a city in the background. Exclusive design to celebrate an endless alliance. The exterior features a two-color scheme with alternating matte and gloss colors. The leading element of the bodywork is a thin red line that runs along the roof, engine hood, wing mirrors, and external profiles of the air vents. This stylistic element recalls the unmistakable Pirelli brand, the logo of which is visible at the start of the lines, both along the roof and the tires. The red line that complements the bodywork is also repeated in the interior, where it runs along the passenger compartment and the seats, also decorated with the Lamborghini and Pirelli logos. Finally, to stress the exclusive character of this special series, each specimen will feature a "Pirelli serie speciale" (Pirelli special edition) plate internally.